A New Tea Event in the Valley! We're excited to announce our newest project, Las Vegas Tea Series. Did you ever want to know how to steep the perfect cuppa? Pairing cheese and tea? And what's puerh tea. Find out more about the Las Vegas tea series here. 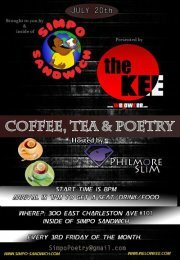 Simpo Sandwich will have their first Coffee, Tea, and Poetry night. Tea will be served by yours truly!